OXFORD, Miss. – Richard Edmonson lost his life to amyotrophic lateral sclerosis, or ALS, in 2015, but his memory is forever linked to the University of Mississippi. Nathaniel Snyder of Myrtle Beach, South Carolina, is the first recipient of a UM scholarship established to pay tribute to Edmonson. 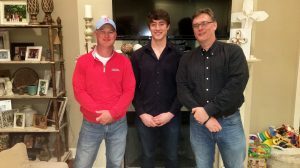 Snyder, who graduated from Ole Miss with a bachelor’s degree in accountancy in 2017, recently completed his first year at the School of Law using the Richard “Richie” M. Edmonson Jr. Memorial Scholarship to supplement his tuition. Edmonson, of Madison, was a partner at Markow Walker law firm for 24 years and was an A-rated attorney by Martindale Hubbell. “Richie was always very goal-oriented,” said Lisa Bane, Edmonson’s wife. “He would see something he wanted to accomplish and he would never give up until he had achieved his goals. He had a great drive and determination to succeed at everything he attempted. Edmonson chose UM for his college home, earning both undergraduate and law degrees. He excelled in academics, particularly in his pursuit of his legal education, and was active in Kappa Sigma Fraternity, Order of Omega, Mortar Board, Phi Delta Phi and the Mississippi Law Journal staff. In addition, the well-rounded student was active in intramural sports, with flag football as his favored activity. After college, he enjoyed spending time with Lisa and their three daughters, as well as going mountain and road biking, running, hunting and whitewater rafting. 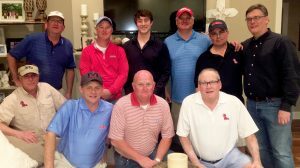 Fraternity brothers and family members sponsor a golf tournament in Oxford each year to raise money for the scholarship. The Edmonson Scholarship Fund is open to gifts from individuals and organizations. To contribute, send checks with the fund’s name noted in the memo line to the University of Mississippi Foundation, 406 University Ave., University, MS 38655; or visit http://www.umfoundation.com/makeagift. For more information, contact Suzette Matthews, development officer for the School of Law, at suzette@olemiss.edu or 662-915-1122.